Caveat: I've known Tamara for years now, and have come to love both her writings and her as a friend. When she announced this series on her blog and the subsequent book it was going to lead into, I could not wait to read everything associated with it, and even contribute my own little piece. You can order your own copy of Tamara's book (although she'd probably flatly deny this is "her" book as much as it is "everyone's" book) here. For the most part, guys are never taught how to emotionally affirm one another aside from the occasional "I hear ya" or "Dude..." snippets of "being open" that we let slide between us in conversation, using both phrases interchangeably for both good news and bad. We almost dismiss the notion that sharing the deep emotional connections associated with opening ourselves up with one another can bond and bring a sense of unity in struggles and joy as well as rating our belches after eating spicy food can. But if we are truly honest with ourselves, the head-shaking worthy mystery we ascribe to women and their ability to open themselves up and let the past flow freely - many times to complete strangers - is something we yearn for at the deepest core of ourselves. What A Woman Is Worth, at the basic level, is a collection of first-person essays from women who are opening their stories and their lives up not to scrutiny but to community. And in doing so, they gift the reader with illustrations of both healing and pain that, regardless of gender, individuals can connect with and find parts of themselves in. From the opening lines of the introduction, WAWIW grips the reader. Not so much that the narratives told in the anthology from almost three dozen women grab your face and force you to stare unblinking into the experiences being shared; rather, the tone and structure of the chapters, deftly edited and arranged by Tamara Lunardo, makes the work feel as if the author of each piece quietly reaches out their hand to yours, and they gently hold it and gaze into your eyes as a portion of their life story unfolds for your benefit and theirs. The end result is humbling and manages to convey a sensation of shared loss between the reader and the author over the chapters in their lives they discuss. While some might dismissively and erroneously assume that WAWIW contains tale after tale of how these women were mistreated by the fathers/boyfriends/spouses in their lives and it drained them of a sense of self-worth, the variety and range of personal experiences shared by the authors show time and again how generationally, socially, and institutionally we as a people have failed to break cycles, stereotypes, and patterns of abuse. As a father of two boys, this book contains lessons and illustrations that I needed reminders of on how to show forth dignity and love to their mom especially but to women in general. More than simply an outlet for venting, therapy, or crying out against injustice towards a gender, WAWIW shows hope on every page. This hope comes in the form of that in sharing these stories, a trail is not so much blazed as it is illuminated for others who may find themselves on similar journeys. From cover to credits, WAWIW is quite possibly one of the best anthology books I have ever read. The cover illustration alone could be scrutinized for months - the lone woman, carrying her baggage with her head covered, back turned to the reader, walking down a long, wide path while barefoot. I personally imagine the face of the woman on the cover to be smiling a bit, head lifted towards the sky. She's not shedding tears for the path behind her as much as she is drawing comfort in the knowledge she has the strength to face whatever else may lie down the path before her. Well, since April is National Poetry Month, and I've been all melancholy as of late...it's like the two themes go hand in hand. So, here's my (poor) attempt at expression through poetry. I stare at the computer screen. The cursor - aptly named - blinking at me. Mocking the empty spaces. Almost nervously twitching, awaiting to be used to fill spaces with ideas and thoughts to share with the ones who will read them. And still, the words won't come. I stare at the blank page before me. Pen to paper, tactile therapy. The rhythm and cadence of scratching out words. Creating onto something what once was nothing. Frustration. Anxiety. Despair. Now these sit and stare back at me in the void of where the words once were. Unhealthy thoughts. Unhealthy actions. Spurred on by my depression over a sensation of loss that ironically, I can't even communicate. I miss the joy. I miss the excitement. I miss the ecstasy of playing the role of conductor, arranging the characters into a symphony of life and connection. And this is echoed in my feeling of loss of not sensing the Creator. And still. The words won't come. 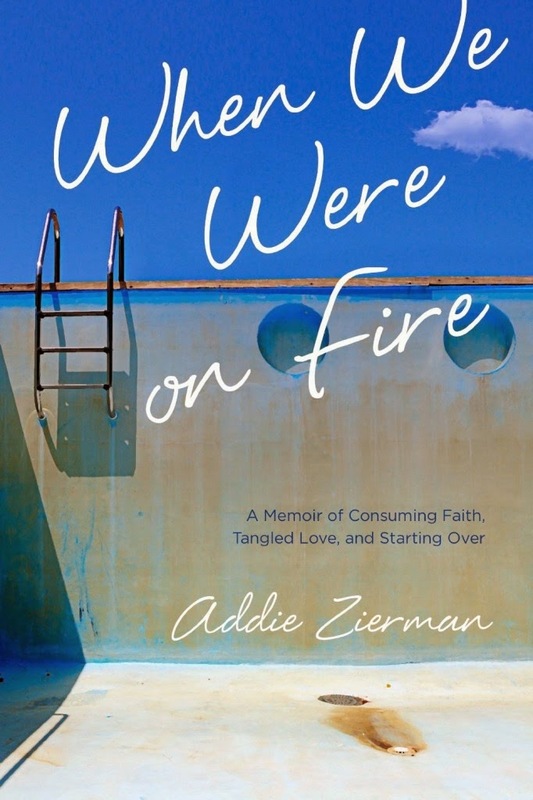 While tracking the progress Addie Zierman was making on her recent signing/reading/promotional tour for her book When We Were On Fire, I noticed she was going to be traveling close to my home in South Carolina. Although I wanted to go hear her, having just completed a six-hour round trip in my car a few days earlier, the idea of yet anther trip sounded massively less than appealing. Plus, it was a school night. I couldn't stay out late. After noting that she was going to be driving through Columbia while en route to her next destination, I sent her a message asking if she and her kids might need a travel respite so as to break the monotony/insanity instead of driving straight through. I had met Addie before, but it was only briefly at the Story Conference in Chicago two years ago. Both our oldest boys are only two months apart in age, so we have a bit of a connection there. But to be honest, I wasn't sure if she'd take me up on the offer. I forgot the cardinal rule: friends online are friends in real life. So after agreeing to come by my house for the boys to play on the fort in the backyard, I had a moment of slight panic when I realized she was coming to my house. Mercifully, I'd already cleaned earlier, so a little spot sweeping/vacuuming/Lysoling was all that was needed to make the house look less like an explosion of laundry and dishes had taken place and more like a home. Her kids. Entering the house. And going into Kai's room. Bear in mind this fear did not stem from me being worried about them breaking/destroying/messing up anything in his room; it IS the room of a five-year-old boy, which means it's in a constant state of chaos. 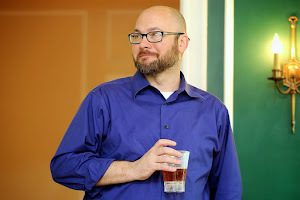 Instead, I was concerned because I'm fairly certain that this was the first time a fellow parent who is also a writer whom I know is a believer who has a kid roughly the same age as mine had been to my house and gone to my son's room. Additionally, my fear did not stem from Addie as a person. Addie the writer is an open book (pun intended), and is as genuine a soul as you are ever to meet this side of Paradise. I was a dad hosting another mom in my house. My upbringing in the South and the nigh-phobic mania with "MAKE THE HOUSE LOOK GOOD BEFORE COMPANY COMES CALLING" is as ingrained to us as is the drawl with which (most of us) speak. Any parent worth their salt will tell you: want to raise up the poster child of what a well-rounded kid is. Case in point: we will check out various Web sites, read story after story of "Hey my kid hated vegetables until I tried XYZ now it's all they want to eat," attempt to replicate said food, and then curse our lives as our child proves yet again to be the pickiest eater imaginable and we fall back on grilled cheese as a meal for the fourth time this week. We then say not-nice-things about the lying sack of excrement who wrote that fake pro-veggie blog post in the first place, all the while living in dread of the next play date when we have the only kid who uses carrot sticks as a weapon and not a food source. Sometimes, Christian parents are the worst. We judge, and we judge hard. We critique what other parents let their kids watch on television, play with, and collect. When you're single, sometimes the litmus test of "how 'good' of a believer are you?" comes in the form of how many Bible studies you attend, how much do you volunteer at church, and the like. As parents, we might as well name all our kids "Isaac," because we're far too ready at times to sacrifice them on the altar of good perception. Yet too few of us have the faith to believe our kids would make it back down the mountain with us. I breathed a sigh of relief as her boys exclaimed with boundless joy over the Teenage Mutant Ninja Turtles, Power Rangers, swords (actual toy ones, not "of the Spirit" ones), Cars vehicles, and other such items littering his floor (and bed, and closet, and...). Other "Christian" parents might have raised an eyebrow over how our DVD cabinet is weighted towards Pixar and not VeggieTales. Other parents might have pursed their lips at the stockpile of Goldfish Crackers (enough to last a nuclear winter) and how they were not straight from Whole Foods. Yet I was gifted with a visit from two energetic kids who ran in my hall (gleefully, because that's how mine do it), played with toys other parents might suggest hold an "evil" sway over their kids (those darn Pokemon cards! ), and got to have an actual grown-up conversation in the middle of the day with someone writes so magnificently that her grocery list is undoubtedly written with such grace publishers could get into a bidding war over it. And if nothing else, seeing Addie and her boys reminded me that life is all about the mess and how we deal with it. We can stress about it to the point of where we become so comfortable in the facade of everything is okay on the surface that we never deal with the dirt under the rug. Or, we can choose to embrace that everyone has cracker crumbs under their cushions. It's not gross. It's not a judgment call on you as a person.